I’ve badgered my friend in Germany for this recipe since we returned from our holiday, she claimed it was a secret, passed on from another friend, but I knew I’d prize it from her eventually!! 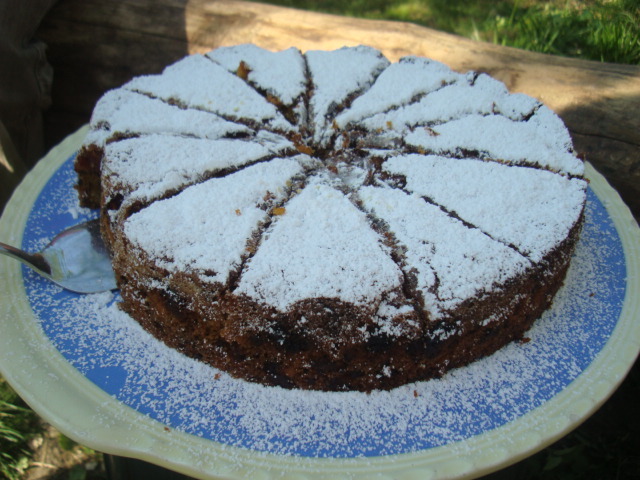 It is a simple cake to make but such a delight; gorgeously rich, but moist and fruity at the same time made all the better for the optional addition of a couple of tablespoons of rum. Butter a 9 inch cake tin and preheat the oven to 175 degrees C.
Mix the butter and sugar until light and fluffy. Add eggs one at a time and mix in well. Sift baking powder, flour and cinnamon together and stir into the mixture, then fold in the chocolate and almonds. Put two-thirds of the mixture into the tin then mix the cherries into the remaining third. Put that mixture on top. Bake for 60 to 70 minutes but keep an eye on it, you might need to cover the top to prevent it burning. Remove from the oven and allow to cool before sprinkling with icing sugar. Serve with cream or just as it comes with afternoon tea!